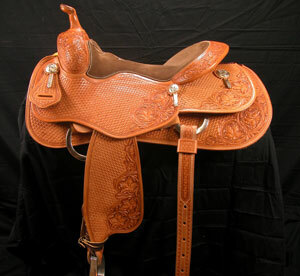 At Avila's Pro Shop™ we have developed a line of saddles for the trainer, the cowboy, and the showman. We have carefully designed and contracted with one of the finest saddlemakers in the world to build these saddles solely for Avila's Pro Shop™. We went one step further to ensure the highest possible quality by purchasing all leather materials from Hermann Oak, only Timberline saddle trees, and stainless steel hardware. This "hands-on" quality control is irreplaceable in order to maintain your confidence in the workmanship of our products. We have two new Bitterroot saddles in stock and when they are sold there will be no more new ones. Tim has decided to retire. His expertise would be hard to replace so we have chosen not to persue finding someone to continue. We will have used ones from time to time however.